Heat transfer from inside a thick molding will be far more limiting compared to heat removal from the tool. That is why conformal cooling or chilled air or more common systems that use nitrogen (very common in Germany) will not produce any substantial reduction in cycle time. Tool side cooling technologies work only when heat is delivered to tool fast enough and that is only in small thickness parts. Having rapid chilling can produce stress. One thing that may really benefit with cooling time reduction will be to use as low as possible melt temperature. If melt is reduced by 20-30 deg. C you will get amazing cycle time reduction (combined with as high a practical ejection temperature). Look at frozen skin criterion for ejection, not text book % and adjust core cavity temperatures (differential) so that highest temperature is in geometric mid plane of part. I'm busy with parts at nearly 20mm thick and am more concerned about evenness of cooling in all parts of the component than chasing the quickest cycle time. Certainly too rapid cooling can limit the amount of crystallization in semi-crystalline materials and if a thick part, you can get difficulties caused by differential levels of crystallization through the thickness of the part. 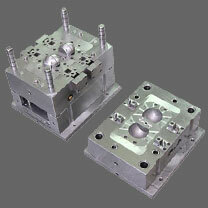 Post-molding crystallization can cause problems of consequential differential shrinkage as time progresses. Days, weeks or even months afterwards, you may even see cracking, with no applied loading. It is a fact that more heat will be removed by water at a relatively high temperature than chilled air. Simulation by Moldcool or similar and modifying cooling lines accordingly can help greatly in lessening differential cooling rates at different locations in the tool/component interface. I have even helped rescue a project by insulating part of the cooling circuit, as some areas of the molding were well below molding shop ambient temperature at time of ejection, while others were still significantly higher than ambient (i.e., unforced air cooling!) almost two hours later. This was in a part no thicker than 6mm.